What is the primary purpose of a home alarm system? Some would argue that its purpose is to deter criminal activity while others might say that its purpose is to detect it. Regardless where you stand on the issue, motion detecting technology is a critical component in many home security systems. But how does motion sensing technology work, and how does it deter burglars? In this guide, you will find a wealth of information about the different types of motion detecting technology, including motion sensor lights. You will also learn the pros and cons of this kind of security technology and receive tips for choosing the right option for your home. So, if you are ready to learn about motion sensor lights, keep reading! What are the Pros and Cons of Motion Sensor Lights? Motion sensor lights come in all shapes and sizes. Some are rather basic and may cost as little as $10 each while others are very complex and utilize components of advanced technology. No matter what kind of motion sensor light you choose, they all serve one primary purpose – to detect and deter burglars. The way that motion sensor lights work is that they remain off until the sensor detects motion. When motion is detected, the light turns on, and that will typically send the burglar running. Motion sensor lights are usually very easy to install – you don’t need to hire a professional, and some are completely wireless. Motion sensor lights conserve energy because they only turn on when they sense motion – many are also solar-powered. Installing motion sensor lights can deter burglars by turning on suddenly when they sense movement – this can startle the burglar and prevent him from continuing to gain entry to your home. Most motion sensor lights run on small batteries, or they may be solar-powered – they don’t require much energy to operate. You cannot control when the light turns on – as long as it is activated, it will turn on when it senses motion. Motion sensor lights only remain on for so long before automatically shutting off. You may have to check and replace the battery for motion sensor lights every so often. For solar-powered lights, you need to install them in an area that gets at least several hours of sunlight each day or the light won’t work. The benefits that any motion sensor light offers will depend on the type of technology it uses. Some motion sensor lights are more sensitive than others, and some offer additional security features like triggering an alarm or initiating video surveillance. One of the key components in a home security system is motion detecting technology. Depending on the kind of home security system you have, different things might happen when the system detects motion. One option is that the motion detecting technology will trigger an alarm when motion is detected. If you are at home, this will alert you to the fact that someone has entered your home. If you have a monitored home security system, it will also send an alert to the monitoring company. They will call you to verify the threat – if you are not home or if you confirm the threat, the company will dispatch the authorities to your residence. Infrared – This type of motion sensor detects body heat or infrared energy. IR sensors are the most commonly used type of motion sensor in home security systems. The sensors may be tripped by a rapid change in infrared energy levels or by a moving object blocking part of the protective grid. Microwave – This motion sensor sends out microwave pulses and then measures the degree of reflection off a moving object. Microwave sensors can cover larger areas than infrared sensors but they are costlier, and they are more vulnerable to electrical interference than an IR sensor. Area Reflective – This type of motion sensor emits infrared rays from a LED then measures the reflection of those rays off of people and objects. The sensor measures the distance from the sensor to the individual or object to determine if it is in the restricted zone. Ultrasonic – This motion sensor emits ultrasonic wave pulses and then measures their reflection off of a moving object. Vibration – This type of sensor detects vibration. Vibration sensors are very basic and can even be made at home, but they can also be a little unreliable. Contact – This type of sensor is usually used for windows and doors and are a type of passive infrared sensor. Two pieces are attached to the window and the frame – when the connection is interrupted by opening the window, the alarm is triggered. In addition to these most common types of motion sensors, some other options can be incorporated into your home security system. For one thing, many of the motion sensors already mentioned can be either wired or wireless. Most newer motion sensors are wireless which makes them very easy to setup and they can communicate with other components of your home security system. You can also find motion sensors that are immune to pets – this reduces the risk for a false alarm being triggered by your dog or cat. There are also video motion sensors which begin recording when they sense movement – this saves you memory space since you only record footage when motion has been detected in the covered area. Type of Light – Motion sensor lights come in a variety of shapes and forms. Some motion sensor lights are designed to double as decorative lighting while others are flood lights or spot lights. 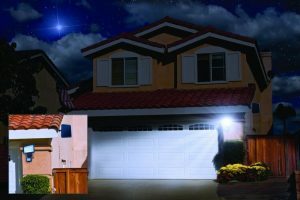 Brightness – Its purpose will determine the brightness you choose for your motion sensor light – is the light for security or safety? For security, choose a motion sensor light of 300 watts or more. For safety and visibility, something around 150 watts could be sufficient. Range – If you are using motion sensor lights for security, the range of the motion sensor is very important. Keep in mind that motion sensors with larger ranges are more expensive and they are more prone to false alarms as well. Detection Zone – The detection zone for a motion sensor light is the width of coverage the motion sensor offers. If you are placing it on the corner of a building, 90 degrees is adequate for the detection zone. For other uses such as flat walls, 180 degrees might be better. Installation – Some motion sensor lights are very easy to install while others are not – some need to be plugged into your home’s electrical system while others are completely autonomous. If special tools are required for installation, consider hiring a professional to do the job. Cost – The cost for motion sensor lights varies according to their type as well as their size and strength. You can find basic models for as little as $10 each, or you could spend upwards of $50 for a single light. Power Source – As it has already been mentioned, motion sensors can have different power sources – solar-powered options are popular, though there are also motion lights powered by battery and ones that need to be plugged into your home’s electrical system. If you want to discourage burglars from targeting your home, installing motion sensor lights may be a good way to do that. Motion sensor lights come in all shapes and sizes, and they are available at different price points. Though you can certainly install a system of motion sensor lights alone, they usually work best as part of a complete home security system. In the end, however, it is your choice how you want to protect and secure your home.